19 x 21", 300hp @ 130rpm engine, Bell Engine Works, buffalo, NY. 1884. 6' 8" x 13' @ 110# steam firebox boiler by M. Riter, Buffalo, NY. 1884. 1890, Jun 20 Burned at Heffort's dock, Buffalo, NY. 1899 Owned Maytham tug line. 1900, May 12 Burned slightly, Buffalo. 1907, Apr 24 Stranded, Lake Erie. 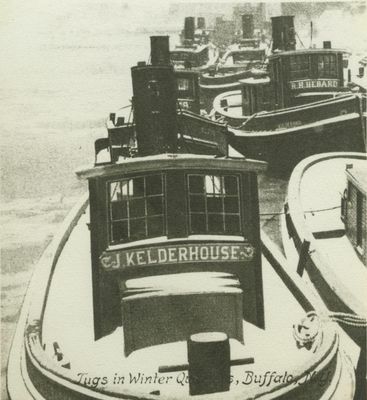 Email your Order Comment on this item Create electronic postcard In winter quarters, Buffalo, NY.